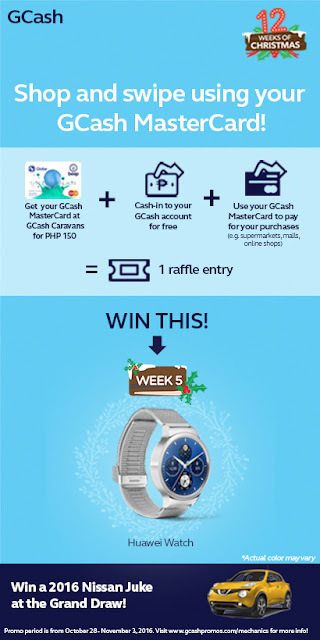 Win a Huawei Watch this week (October 28 - November 3, 2016) simply by swiping your GCash MasterCard to pay for your shopping. No GCash MasterCard yet? Don't worry, its easy to get one. All you have to do is download the GCash App on your mobile phone and register your Globe number and you're all set to shop. You can avail of the GCash MasterCard for only P150 at GCash Caravans or in selected Globe Stores. Adding funds to your GCash wallet is also a breeze. You can just go to any Globe Store, SM Business Center, Puregold, Cebuana Lhuillier Pawnshop, Tambunting Pawnshop, Villarica Pawnshop and 7-Eleven branches. Aside from getting a chance to win a Huawei Watch this week, you are also eligible to join the Grand Raffle Draw and Win a 2016 Nissan Juke. A transaction is equivalent to 1 raffle ticket so the more your shop using your GCash MasterCard, the more raffle ticket you get and more chance at winning. Aja!